CONVERTS PHONO SIGNALS: A turntable preamp that converts phono signals to Line Level Signals. This state-of-the-art circuitry phono preamp can accommodate magnetic pickups with an input sensitivity of 3mV at 50K Ohms. LOW NOISE OPERATION: Offers outstanding performance with it's Low-Noise Audio Operational Amplifiers. The output is 2V max (P-P) at 10K Ohms. It's better to position the preamp close to the source to reduce unwanted noise and interference. CONNECTS TO TURNTABLES: Connect any turntable to modern sound equipment without specialized phono input for amplifying music. For the receiver, this can be connected to speakers, computers, laptops and more. 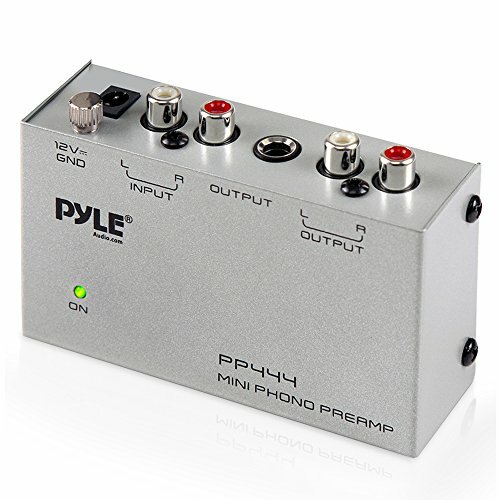 SIMPLE PLUG & PLAY: This mini preamp has stereo RCA inputs and stereo RCA outputs. Connect the turntable to the RCA inputs and ground. Then, connect the amplifier receiver to the RCA outputs. 1 YEAR WARRANTY: We guarantee this electric phono preamplifier with both a 30 day no hassle money back return policy and a 1 year manufacturer's guarantee.